Why is honey antimicrobial? Its components make it like that. There are components that induce an indirect antimicrobial action, the microbial infection being fought by its immuno-activating, anti-inflammatory and prebiotic activity, and components or features that induce a direct antimicrobial activity. This one is given by 2 types of antimicrobial activity, generally accepted in honey: hydrogen peroxide activity and non-peroxide activity. Honey produces hydrogen peroxide (H2O2) through an enzyme called GLUCOSE OXIDASE (called inhibine in the past). It is added by the bees in the nectar they collected from the flowers and it oxidizes the glucose found in it. It yields gluconolactone (which equilibrates with gluconic acid, the principal acid of honey) and also produces hydrogen peroxide, which would be of effect only during the ripening of honey, because a full-strength ripe honey has a negligible, almost undetectable level of hydrogen peroxide. Oxidase remains inactive in ripe honey, due to its very low pH. The enzyme has an optimum pH of 6.1, with a good activity from pH 5.5 to pH 8, but the activity drops off sharply below pH 5.5 to near zero at pH 4, which is why it stays inactive in ripe honey. It will be activated again when the honey is diluted with water, or when enters in contact with the body fluids found in an open wound. On dilution the activity increases by a factor of 2500-50 000. See more on how it works here. – Glucose oxidase can be destroyed by another enzyme, catalase, which is sometimes present in large quantities in the nectar of some flowers. This was first showed in1962 by Adcock. – Glucose oxidase can be destroyed when exposed to light (in some honeys even a very small amount of visible light is enough to destroy it completely, while others are not affected even by strong sunlight.) In a regular honey, the resultant between the two enzymes will determine the peroxide capacity of honey. – Glucose oxidase is also very sensitive to heat (Even to that created by microwave ovens). It is considered to be pretty stable till 55º C.
Some honeys show a very high peroxide activity, Jarrah honey being an eloquent example, but others do not accumulate hydrogen peroxide at all. Manuka honey is included in this category. The variation in hydrogen peroxide accumulation in honeys is given by the differences in levels of glucose oxidase. There are no studies performed to assess the concentration of glucose oxidase in honey. Generally, dark honeys are considered to have a higher peroxide activity (according to DUSTMANN, J H, 1979 and WHITE, J W; SUBERS, M H, 1963). The concentration of hydrogen peroxide on a non-toxic and stable level is probably regulated by antioxidants and pollen-derived catalase which destroy excess amounts of H2O2 [Kędzia B, 2008]. 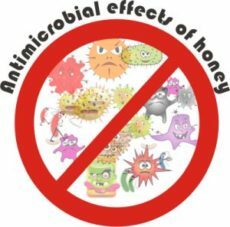 All the other factors that are present in honey and give an antimicrobial activity, but are not connected to the peroxide activity, are considered to be non-peroxide activity. According to their botanical and geographical source, honeys have different chemical properties and different features that trigger their antimicrobial activity. Honeys have a low pH. Blossom honeys have a pH between 3.3 to 4.6 (chestnut honey being an exception, with a pH between 5 and 6) and honeydew honeys a relatively higher pH of 4.5 to 6.5. Honey acts like a buffer, meaning that its pH does not change by the addition of small quantities of acids and bases. The buffer capacity is due to the content of phosphates, carbonates and other mineral salts present in honey. The low pH of honey was shown to have antibacterial effect by YATSUNAMI, K et al. in 1984 and other scientists that confirmed its importance as an antimicrobial factor. The main explanation would be that honey acts best against bacteria in acedic medium and the wound medium is acidic. Nevertheless others disagreed with this theory. This low pH is primarily due to the content of acids, most of them added by the bees. The main acid is gluconic acid (gluconolactone) a product of glucose oxidation by the enzyme glucose oxidase, with average values of 0.23-0.98%. However, this acid is present as its internal ester, a lactone, and does not contribute to honey’s active acidity. Other acids have been found in minor amounts: formic, acetic, citric, lactic, maleic, malic, oxalic, pyroglutamic and succinic (MATO, I, 2003). 2. Low water content – High sugar content. High osmolarity. The principal oligosaccharides in blossom honeys are disaccharides: sucrose, maltose, turanose, erlose. Honeydew honeys also contain the trisaccharides: melezitose and raffinose. Trace amounts of tetra and pentasaccharides have also been isolated. The water content of honey is very low, usually between 15 to 21%. These two characteristics, low content of water and high amount of sugars, are, by some scientists, enough to hinder the growth of microbes. The strong interaction of the sugar molecules with water molecules leaves very few of the water molecules available for microorganisms. Fungi are generally much more tolerant of low water content than bacteria are. Staphylococcus aureus has an exceptionally high tolerance of low water content, yet it is one of the species most sensitive to the antibacterial activity of honey. Studies demonstrated quite clearly that there is much more involved in its complete inhibition than the osmotic effect. 3,5-dimethoxy-4-hydroxybenzoic acid (syringic acid), methyl 3,5-dimethoxy-4- hydroxybenzoate (methyl syringate), and 3,4,5-trimethoxybenzoic acid. 2-hydroxy-3-phenylpropionic acid, a phenolic acid identified as the major component of the ether extract of manuka honey, accounting for 1.6-3.2% of its non-peroxide activity. 1,4-dihydroxybenzene, the major component of the ether extract of vipers bugloss honey. Some scientists claim that the entire non-peroxide activity of vipers bugloss is due to this component. Many of the poliphenols including phenolic acids and flavonoids present in honey have been shown to have antibacterial activity. In a study with Cuban unifloral honeys, honeys with higher phenolic content tended to have a higher antibacterial activity (ALVAREZ-SUAREZ, J M et al., 2010). Pinocembrin – is a major flavonoid in propolis, and the flavonoid composition of honey and propolis have a similar pattern. However, flavonoids dissolve only a little into honey: the level of pinocembrin was found to be only 1-2% of what would be required to account for the observed non-peroxide activity. Yet, some scientists consider it important in the whole picture of antimicrobial activity of honey. Manuka honey is widely recognized as a strong antimicrobial honey, due to the presence of this methylglyoxal, aka MGO or MG. This is a substance formed from sugars during heat treatment of prolonged storage of carbohydrate-containing foods and beverages. There have been found concentrations of MGO in fermented milk products, wine, beer and roasted coffee in the range of 3 to 47 mg/kg. In manuka honey and other honeys sourced in Leptospermum trees, MGO is formed by conversion of dihydroxyacetone (DHA) present at exceptionally high concentrations in the nectar of the trees’ flowers. Ripe manuka honey contains both MGO and DHA, and in time DHA converts to MGO too, and increase the quantity of it. In Manuka honey from New Zealand MGO can reach levels of 1282 mg/kg and Berringa honey from Australia can even have above 1700 mg/kg. MGO is a reactive metabolite that can exert toxic effects. While its beneficial efects on wounds are well recognized, there are still concerns regarding potential toxicity of dietary MGO in honey. Read more about its safety, and hidden bad effects on diabetics. This is an antibacterial honey protein, which originates in royal jelly, was also found in honey (KWAKMAN, P H S et al., 2010). It is secreted by the bee (in its hypopharyngeal gland) and the amount found in honeys varies from honey to honey. · Sebastian A.J. Zaat et al., in a 2010 study “Honey as an antibiotic: Scientists identify a secret ingredient in honey that kills bacteria” developed a method to selectively neutralize the known antibacterial factors in honey and determine their individual antibacterial contributions. Researchers isolated the defensin-1 protein, which is part of the honey bee immune system and is added by bees to honey. · The 2011 study “Two Major Medicinal Honeys Have Different Mechanisms of Bactericidal Activity“, by Paulus H. S. Kwakman et al., aimed to assess the bactericidal activity and mechanism of action, two medical grade honeys, approved for application in wound management: Manuka honey and Revamil honey UMF16+. The results showed that both revamil honey and manuka honey had highly distinct compositions of bactericidal factors and showed substantial differences in bactericidal activity. Raw honey contains microorganisms and they can also contribute to the antimicrobial power of honey. They have no effect on humans. A research group conducted by Prof. Hyungjae Lee in 2008 revealed that honey should be considered as a potential source of microorganisms producing promising antimicrobial compounds, especially bacteriocins. • The bacterial isolate TH13 was found as an efficient producer of peptide compound with high activity against P. larvaespp. larvae, which are etiological agents of American Foulbrood. It is a disease of honeybees that results in the annihilation of the honeybee colony. • Another isolate, identified as Bacillus thuringiensis SF316, was shown to efficiently produced thuricin H, a bacteriocin which strongly inhibits the growth of Bacillus cereus. Among all the bacterial indicator strains, Listeria monocytogenes had highest susceptibility (69%) to the various antimicrobial compounds produced by all active bacterial isolates (1655 out of 2398), whereas S. aureus showed the second highest susceptibility of all indicator microorganisms tested. • The bacterium H215 showed high antifungal activity against B. fulva H25 -which is a spoilage mould associated with juices and beverages. • ZHAO, X et al. izsolated in 2013 other antifungal peptides from Bacillus BH072, another novel bacterium present in honey (study). The peptide showed antifungal activity against mold such as: Aspergillus niger, Pythium, and Botrytis cinerea. These products are present in Canadian honey and probably also in any honey and have an antibacterial activity. In some smaller amounts, these substances are also present in fresh honey, but the Millanrd products are found in older honeys, or honeys that have been heated. A Maillard reaction is a chemical reaction between an amino acid and a reducing sugar in heat environment, above 285°F (140°C). The Maillard reaction is responsible for many colors and flavors in foodstuffs: caramel made from milk and sugar, the browning of bread into toast, the color of beer, chocolate, coffee, and maple syrup. Read more about what happens to honey if it is heated or aged. 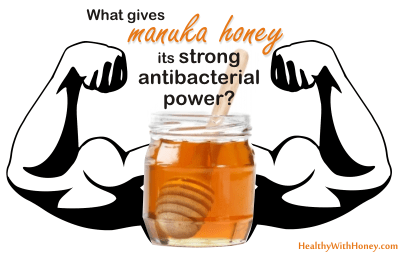 Can diabetics eat MANUKA HONEY? What bacteria can honey kill?